For recent recordings in particular, thanks go to Betty Stewart, Colin Lowry, Edwin McWilliams, Elaine Cullen & Emma Gribben of SOAR, Frank McWhirter, Hampton Hewitt, James Magowan, Joe Love, Linda McMahon, Mary Loughran, Noel Dalgleish, Richard Dougan, Richard Hunter, Sam Hetherington, Tatjana Nikolajeva, Tommy Wallace and Trevor Dalzell. Joseph Canning contributed an article about the military service of people from the area in WW1 (very topical in the 2014 centenary year) and James Magowan's sister, Rachel, contributed an article on her grandfather, Sir John Hall Magowan of Mountnorris, who also fought in WW1. 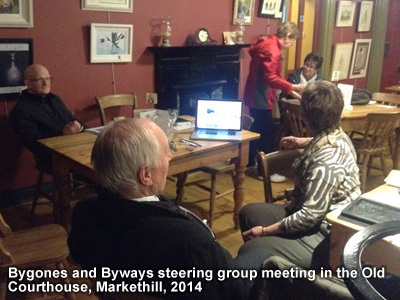 There are many more contributions, also, for which we're grateful, many by members of the project steering group. 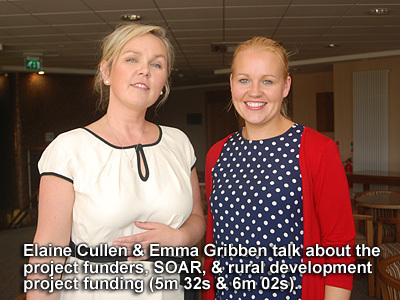 In the accompanying recording, Elaine Cullen, Craigavon Borough Council Programme Manager for the Southern Organisation for Action in Rural Areas (SOAR) programme, talks about SOAR and rural development project funding. 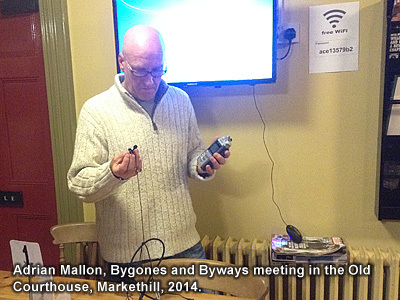 Use the audio controller to listen to this talk, given in September 2013. Listen also to the recording of Emma Gribben, Armagh City & District Couci Project Officer for SOAR, who also talks about SOAR and the Bygones and Byways project update funding. Mrs Barbara Ferguson (Armagh Guided Tours). 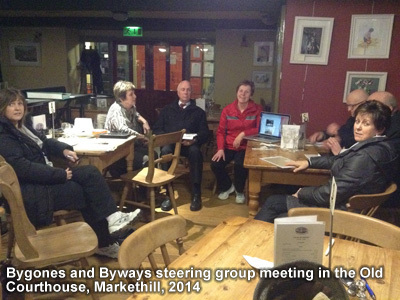 Finally, thank you, the members of Markethill and District community who contributed, and continue to contribute, information, old photographs and advice. 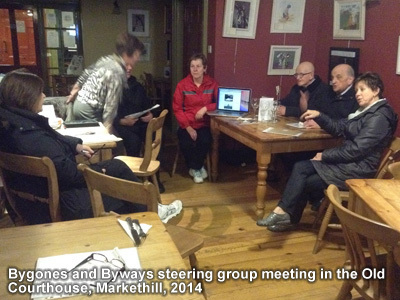 Except where otherwise stated, all text information is copyright Markethill District Enterprises Limited 2003, 2014. Except where otherwise stated, all software, design, graphics, photos and sound recording elements are copyright Adrian Mallon Multimedia 2003, 2014. The introductory music to the 2003 CD-ROM is copyright Robin Alexander. D/266/378/67 (Gallogly's Division and Mouse Hill), D288/70, D/266/378/53, D/1606/6A/1, D/1606/6B/1, D/1606/6A/2 (Rough map of Markethill, n.d. but pre-1835), D/1606/6B/5 (Hamiltons Bawn for Sir Hans Hamilton), D/384/2 (Owen Swann's map of 'Colmalish' Manor), Speede's 1610 General map of Ireland in PRONI catalogue room, T/2543/1 (State Papers maps), D/1606/6E/2 (1819 maps of Henry Graham's estate), D/1606/12/3/97 (Corhammock House), D/597/4/39, D/1606/6E/1 (Gosford maps 1855), D/597/4/1-90 (Petty's Survey maps c.1665 copied mid-1780s by Daniel O'Brien), Allison Collection photographs: D/2886/A/2/1/1/1,2,3, D/2886/A/2/1/6/2, D/2886/A/2/2/7/3,6, D/2886/A/2/6/4,19,32, D/2886/A/2/12/7/3,13,14, D/2886/A/2/15/5,16. Ordnance Survey memoirs for Ballymore, Kilclooney, Loughgilly and Mullaghbrack parishes in Day, A., and McWilliams, P., eds., Ordnance Survey Memoirs of Ireland: Parishes of County Armagh 1835-8. Vol. 1. (1990). Permission to reproduce the two Vallely paintings of bullet-throwers and fiddlers, which hang in the foyer of Queens University at Armagh. C. F. [Neil] McGleenon, "The Battle of Mullaghbrack, 5th September 1595", Seanchas ard mhacha: Journal of the armagh diocesan historical society, edited by Réamonn Ó Muirí. Many thanks to Armagh County Museum (National Museums and Galleries of Northern Ireland) for permission to reproduce the notes and writings of T. G. F. Paterson and to photograph within the museum.